Ashvin Kumar’s No Fathers in Kashmir, is a tender portrait of first love in the time of the Kashmir crisis. It’s a riveting narrative that feels novel, given that most of Hindi cinema’s love stories set in Kashmir remain completely unaffected by the state’s chaotic past and present. shvin Kumar’s No Fathers in Kashmir is the third Hindi movie release (after Hamid and Notebook) in the last month that is set in the Valley. It’s telling that it’s also the only one that spent nearly a year fighting for a CBFC certificate. The film’s incendiary title, that takes an outright jibe at the Indian armed forces for the disappearances of scores of Kashmiri men, is a dead giveaway to why it might have ruffled the censor board’s feathers. From the very first frame of No Fathers in Kashmir, Kumar, who directed two National Award-winning documentaries – Inshallah, Kashmir and Inshallah, Football (both were set in the conflict-ridden state) – comes across as an opinionated filmmaker who has a lot to say. As a result, the movie is generously littered with “half widows”, forced disappearances, and accusations against security forces for human rights violations. For the most part, Kumar’s evaluation of the Kashmir crisis through the eyes of a helpless younger generation, is a novel, riveting exercise. With the exception of Haider, Hindi cinema has largely stuck to romances set in Kashmir whose trajectory don’t get dictated by the conflict. Usually, love stories set in the state completely ignore its chaotic past and present – in Laila Majnu and Notebook, for instance, the courtship remains unaffected by the tensions in the region. But in No Fathers in Kashmir, the state is both a protagonist and an antagonist. 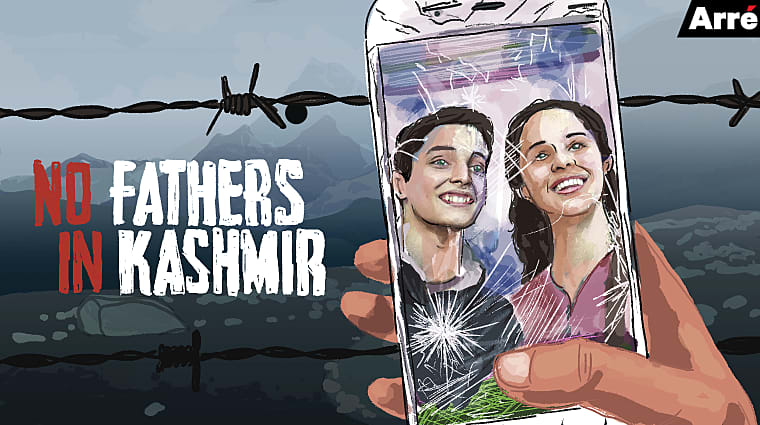 The film revolves around 16-year-old Noor (Zara Webb), a lively Londoner who fishes out her phone to capture every memory, accompanying her mother to Kashmir. The Valley could have been her home had it not been reduced to a living graveyard. It’s a stopover that upends her life: Noor falls in love with Majid (an evocative Shivam Raina), a Kashmiri Muslim who is a reminder of the life that she escaped. Over a few weeks in Kashmir, Noor comes to terms with the truth about her father’s absence. For the last decade of her life, she was told that her father willingly left them. It’s only when Noor meets her grieving grandparents (Soni Razdan is especially haunting) that she discovers that he was in fact one of the countless men who were picked up by the army and never returned: On paper, he isn’t dead yet. No Fathers in Kashmir has a pertinent scene that articulates how easily these disappeared men are erased from the consciousness of the state. While scouting the family photo album, Noor’s grandparents tell her that they had to burn all pictures of her father to avoid further abuse. As a result, there exists no proof of his existence, prompting Noor to start searching for the father she never got the chance to know. To counter that erasure, the film paints a portrait of Kashmir through the multiplying photographs Noor takes on her phone – her carefree tourist gaze serving the documentarian in Kumar. The subjects of her photos shift suddenly from the innocuous to the damaging: Noor captures sunsets, locals ferrying tourists in Dal Lake, walls that scream “Azaadi”, and 16-year-old Majid, covering half of his face and picking up a rifle to pretend as a militant. The latter shot – an outcome of Noor’s desire to take a photo with a terrorist for her Facebook timeline – is followed by Majid being mercilessly thrashed by an officer. The fact that you can predict that Majid is destined to become a victim of the security forces on more than one occasion is revealing, given that the assumption arises not from the film’s predictability, but from the familiar narrative of the violence in Kashmir. Yet even with the tensions looming in the shadows that point to a cyclical way of life and loss, the strength of No Fathers in Kashmir lies in digging out a quiet story of first love and heartbreak that feels rooted in the Valley’s milieu: Noor and Majid fall for each other in the privacy of a cyber cafe where she introduces him to the wonders of the internet, he returns the favour by teaching her the difference between a “terrorist” and “militant” and together they traverse the Valley’s vastness to search for answers that are beyond them. Even their hesitant kiss is shot with a tender gaze, that juxtaposes light and darkness to invoke feeling, mirroring the pathos that seeps into the film’s bittersweet last shot. But in No Fathers in Kashmir, the state is both a protagonist and an antagonist. The trouble then, is that No Fathers in Kashmir partly suffers from its director’s simmering anger and his steadfast urgency to brandish his dissent: Kumar pops up in the movie as Arshid, a police informant who doubles up as an Islamic fanatic, sympathetic to the cause of the militants. A large part of the movie’s puzzle rests on Arshid’s character, which regrettably becomes its weakest track. Kumar’s blank-faced performance is unable to muster up the angst, guilt, or even remorse to dig deep into the psyche of a man rendered delusional by the weight of unending conflict. Even worse, his presence, just like the restless camera’s jerky movements, is distracting and remains far too preoccupied with making a statement: On a closer reading, the provocation indicates a brand of activism that does little justice to a feature film. It’s why some of the detours that No Fathers in Kashmir takes don’t add up, like Kumar painting the security forces as excessively cartoonish or his evasive stance on Islam. Yet No Fathers in Kashmir, just like Hamid, makes a case for necessary viewing, especially with elections around the corner. At its heart, it poses one question that politicians are always prepared to shirk: Can India really develop without acknowledging the people of Kashmir and the damage that decades of violence has wreaked upon them?